GUTS Casino takes awesomeness to a whole new level. Established in 2013, this popular online destination has won numerous awards and became the favorite of many casino enthusiasts. The secret might lay in the combination of diversity, customer friendly approach and wide range of games. One thing is sure, this effective blend provides a high-quality and hassle-free casino experience. 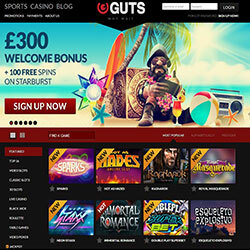 Customers are welcomed with a clear-cut and modern interface when visiting GUTS Casino. We find this really important, since it’s much easier to navigate on a well-organized site. The design is classy and it follows the minimalistic trends without becoming boring. The players are greeted with the newest offers and the game lobby. At the bottom of the homepage, there’s a long list of payment methods. These include Visa, Mastercard, Skrill, Neteller and much more. Basically, they cover all the popular and even the least-known options. . GUTS Casino promises faster payouts to all customer. This means an exceptional two hour interval counted from the withdrawal request. The site is available on all the languages of their customer base, including English, German, Finnish, Swedish and Norwegian. The customer support is covered with a 24/7 live chat, but all members can contact them via e-mail, too. . Besides the mentioned, GUTS Casino’s strength is their huge selection of games from the most famous designers. They offer numerous titles developed by Microgaming, Netent, BetSoft, IGT and Leander Gaming. First of all, players can bet on various sports in the bookmaking section of GUTS Casino. In the Casino menu the visitor will be astounded with the repertoire that has video slots, classic slots, 3D slots, Live Casino games, Blackjack, Roulette, Table games, video poker and other games. . Unfortunately GUTS Casino is not accessible for US residents, but maybe in the future we’ll see them enjoy all these games. During our visit there were six promotions on offer, such as deposit bonuses, free spins, a welcome bonus or gadget giveaway. Some of them were really pleasing, while the others were in need of adjustment. However, GUTS Casino is always preparing with something new, so there’s nothing to worry about. GUTS Casino is based on the world-renowned and award-winning software of Netent, Microgaming, Play’n Go, Betsoft Gaming, Omi Gaming, IGT, Leander Games and Sheriff Gaming. With all the games from these operators GUTS Casino is one of the most diverse online destinations. Furthermore, they’re open to their customers’ suggestions, so their catalog is always expanding. At GUTS Casino 21 enthusiasts can enjoy 17 online and 15 live blackjack tables. The games are provided by such casino experts as Netent, Betsoft, Microgaming, Play’n Go and Evolution. This means that this internet casino is just as much about the quality as the quantity. Besides the usual classics, players can engage in Multi-Hand Perfect Pairs Blackjack, Premier Blackjack High Streak Gold, Pirate 21, Blackjack PRO and more. At the Live Casino lobby there are eight classic blackjack and seven Blackjack VIP tables featuring charming dealers. With such selection and quality, GUTS Casino is highly recommended for all blackjack fans. 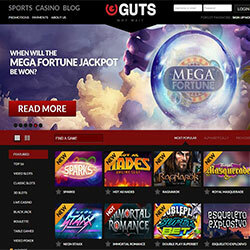 There are numerous other games in GUTS Casino’s collection. Their members can enjoy hours and hours of entertaining classics like Bingo, Keno, Premier Racing, Bubble Bonanza, 7 Gold Scratch or Hall of Fame. These are just some of the most popular titles from the 37 awesome games, so players will surely find at least one for their liking. GUTS Casino has some really exciting promotions for their members. The Welcome Package comes with a 100% Max. GBP 100 first deposit bonus and 25 free spins. It includes three more deposit offers, each with additional freebies. With the Thursday Triple all players can collect 60 free spins. The Double Deal Monday promotion offers a 40% max GBP 40 bonus with 15 free spins. GUTS Casino’s popularity is not surprising since their services are on the highest level possible. Casino enthusiast will find all their favorite games and preferred payment methods at this superb destination. 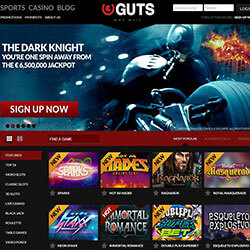 Also, GUTS Casino operates an amazing sportsbook service, where sport fanatics can relish in numerous betting options. Their mobile casino satisfies all casino needs while on the go. Overall, GUTS Casino is a compact and truly enjoyable topnotch site. 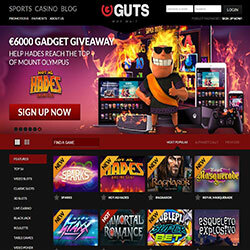 At GUTS Casino you can play numerous Netent, Play’n GO, Microgaming and Betsoft games on your mobile devices. The GUTS Mobile Casino offers Video Slots, Classic Slots, 3D Slots, Live Casino games, Blackjack, Roulette, Table Games, Video Poker and numerous other titles. The site is adjusted to mobile and tablet screens, so it is completely enjoyable and easily managable. For further information check out our full-lenght review on the GUTS Mobile Casino. GUTS Casino has a vast variety of games with live dealers. The repertoire includes popular games like Poker, Blackjack, Baccarat and Roulette. The dealers are attractive and likeable and the game-quality is exceptional. GUTS Casino is a perfect choice for those who’d like a true to life casino experience.